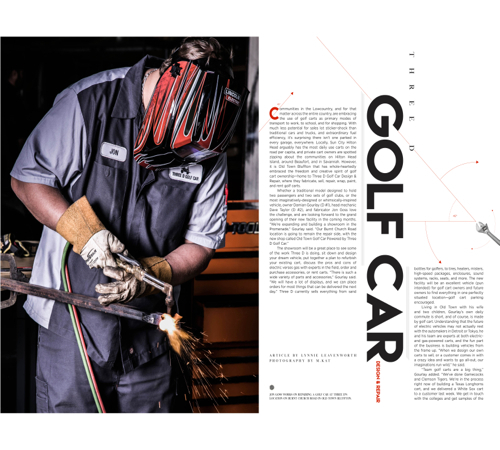 Communities in the Lowcountry, and for that matter across the entire country, are embracing the use of golf carts as primary modes of transport to work, to school, and for shopping. With much less potential for sales lot sticker-shock than traditional cars and trucks, and extraordinary fuel efficiency, it’s surprising there isn’t one parked in every garage, everywhere. Locally, Sun City Hilton Head arguably has the most daily use carts on the road per capita, and private cart owners are spotted zipping about the communities on Hilton Head Island, around Beaufort, and in Savannah. However, it is Old Town Bluffton that has whole-heartedly embraced the freedom and creative spirit of golf cart ownership—home to Three D Golf Car Design & Repair, where they fabricate, sell, repair, wrap, paint, and rent golf carts. The showroom will be a great place to see some of the work Three D is doing, sit down and design your dream vehicle, put together a plan to refurbish your existing cart, discuss the pros and cons of electric verses gas with experts in the field, order and purchase accessories, or rent carts. “There is such a wide variety of parts and accessories,” Gourlay said. “We will have a lot of displays, and we can place orders for most things that can be delivered the next day.” Three D currently sells everything from sand bottles for golfers, to tires, heaters, misters, high-speed packages, enclosures, sound systems, racks, seats, and more. The new facility will be an excellent vehicle (pun intended) for golf cart owners and future owners to find everything in one perfectly situated location—golf cart parking encouraged. Living in Old Town with his wife and two children, Gourlay’s own daily commute is short, and of course, is made by golf cart. Understanding that the future of electric vehicles may not actually rest with the automakers in Detroit or Tokyo, he and his team are experts at both electric- and gas-powered carts, and the fun part of the business is building vehicles from the frame up. “When we design our own carts to sell, or a customer comes in with a crazy idea and wants to go all-out, our imaginations run wild,” he said. 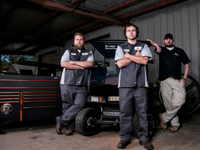 The creative juices never stop flowing at Three D. Gourlay and his team are two years in on an exciting project designing an electric 4X4 golf cart for hunters who take their vehicles through swampy terrain. “We’re in the process of building a prototype,” Gourlay said. “All the other companies have four-wheel drive cars, but there are two different electrical systems on them, which mean double the problems, and they’re expensive to fix. We’re building one that has only one electrical system. It will be an electric car that can be submersible. Because electricity and water don’t go together, we’re focusing on building a box to protect the electrical. A great starting place if you are new to golf carting, or want to learn more, is Three D’s Facebook page, loaded with golf car community information and industry-expert tips about ownership and operation, along with stories about cutting-edge, life-changing, or just plain fun adventures. A recent post outlined a few of the most important rules of golf cart driving, which may be a helpful starting point. 1) Practice good driving etiquette and obey the rules of the road, including using turn signals or hand signals. 2) Utilize seatbelts whenever they are available. 3) Avoid sharp turns at higher speeds, and drive straight up and down slopes—ejections and rollovers are particularly dangerous outcomes when ignoring this tip. And 4) Keep hands and feet inside the cart at all times; and no matter how fun it may sound, keep passengers off the back platform or sides of the vehicle. Three D Golf Car is located at 159 Burnt Church Road, Bluffton. For more information, please call (843) 815-2203 or visit threedgolfcar.com.